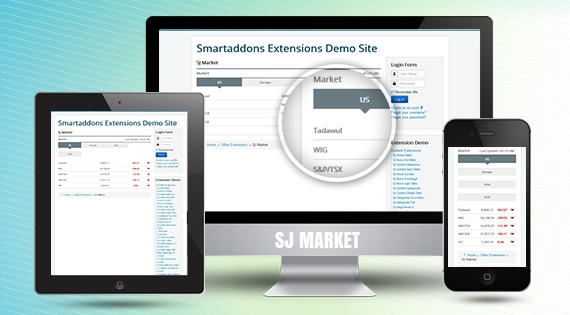 SJ Market is designed with ability of showing stock values and exchange rates according to each country, area... All you need to do is insert company names and stock's symbols. Our module will do the rest for you. SJ Market represents stocks' information as table with: stock's name, stock's price, stock's change. Specially, it is very easy to follow the stock's change by up and down arrows. Besides, SJ Market comes with an easy-to-use back-end that allows you fully control all parameters in the module. You can place it on wherever position you want to make your financial websites be more powerful and attractive. Let's refer to the Demo to see how it work now! See the list of stock's symbols here!